In vivo dosimetry is an essential process during total body irradiation (TBI) to accurately determine the dose delivered to various parts of the body in an attempt to allow a uniform dose delivery to all regions. Various detectors can be used for such processes. Some of these have included TLD's, diodes,,, and MOSFET devices. Su et al., used Gafchromic EBT film for analysis and found that agreement within 4.1% could be achieved compared to TLD measurements. During both in vivo and phantom testing procedures, bolus is normally placed over and around the detector to provide scatter material so that an accurate assessment of applied dose could be made. Most authors have not evaluated or quoted the thickness or the size of this bolus nor whether their bolus or scatter material dimensions are sufficient to adequately provide scattering conditions conducive to accurate dose measurements. Absorbed dose at skin is significantly less compared to dose at depth, due to dose build-up in high energy photon radiations. These values are relatively well known and published for many types of linear accelerators and beam configurations at source to surface distances (SSDs) used in standard clinical treatments.,, These SSDs normally range from 80 to 120 cm SSD. However, at larger distances as used in TBI techniques, data are not so readily available. Allahverdi et al. have shown values of 84% at a field size of 35 cm × 35 cm and SSD of 250 cm for a cobalt 60 machine. Some skin dose values are often quoted for open fields; however, when scattering materials such as Perspex blocking sheets are included in the beams path, these values can change significantly. Khan (2003) states that for TBI a skin dose of at least 90% should be used. It is important to keep skin dose high as the lymphatics near the skin surface (normally 1 mm deep or greater) and the marrow in the ribs, skull, and clavicle could otherwise be under dosed. This work investigates the values for build-up dose measured with various beam and scattering material configurations as would be present for TBI irradiation. We also investigate the effects of the lateral radiation scatter on measured dose and thus evaluate the minimum size and conditions needed to accurately measure applied dose for TBI patients in vivo. Measurements for build-up dose and dose characteristics essential to TBI in vivo dosimetry have been performed on a Varian 600C linear accelerator using a megavoltage photon beam of 6MV energy. Measurement for build-up dose was made using an RMI 457 solid water stack phantom which was positioned at a distance of approximately 300 cm from the X-ray source as would be the general case for TBI irradiations in our center. The measurements were made with an Attix parallel plate ionization chamber and PTW electrometer. The phantom was stacked on the dedicated TBI couch without any beam spoiler, scatter material in front of it to firstly measure the build-up characteristics of a nonscattered X-ray beam for comparison. These measurements were made with differing field sizes ranging from 5 cm × 5 cm 2 up to 40 cm × 40 cm 2 with the 40 cm × 40 cm 2 field being the size used for clinical TBI irradiations in our center. These doses were converted to percentage dose by measuring the maximum dose delivered at each field size as well. These results (40 cm × 40 cm 2 field size) were compared to measurements made with differing positions within the TBI bed with the Perspex scattering plate in position. The TBI beam spoiler consists of a Perspex sheet which is 1 cm thick by 200 cm long and 80 cm high which blocks all of the X-ray beams which are incident on the patient during TBI irradiations. Measurements were made for percentage build-up dose using this plate at varying distances from the source ranging from 270 to 290 cm and the phantom's position remaining at 300 cm. This is shown in [Figure 1]. This allowed for percentage dose measurements to be made with distances between the beam spoiler and the front surface of the stack phantom to range from 10 up to 30 cm. Measurements were made this way to evaluate the changes in measured percentage build-up dose due to the influence of distance from the beam spoiler to the phantom surface. For example, each patient when treated clinically is placed at the center of the TBI bed; however, each part of their body is located at a different distance from the beam spoiler. As an example, in general, the pelvis and shoulders will be closer and the legs and head will be further away. Measurements were also made with differing volumes of 5 mm thick wax bolus/scattering material placed around and over Gafchromic EBT3 film which was positioned in front of a 30 cm thick solid water slab phantom for dose analysis. The bolus material dimensions were varied from 0.5 × 0.5 cm up to 10 cm × 10 cm (all 5 mm thick). All measurements were made using the 40 cm × 40 cm field size (at 100 cm SSD) which magnifies to 120 cm × 120 cm at an SSD of 300 cm and the beam spoiler located at an SSD of 270 cm (or 30 cm) in front of the EBT3 film. The results were normalized to 100% using the 10 cm × 10 cm × 5 mm thick front cover bolus material. Gafchromic EBT3 film (Lot number 03311402) was used for this investigation. The film was used and handled in the process outlined in the AAPM TG-55 report  and the Medical Radiation dosimetry with radiochromic film report series. It has been shown that Gafchromic EBT3 film possesses a low X-ray energy dependence. In this work, all films were analyzed using a PC desktop scanner and Image J software (NIH, Bethesda, Maryland, USA) on a PC workstation at least 24 h after irradiation to minimize effects from postirradiation coloration. The scanner was an Epson 10000XL, dual lens system desktop scanner using a scanning resolution of 72 pixels per inch. The images produced were 48-bit RGB color images and analyzed with the red component of the signal making the final pixel density values 16-bit information. A scanning technique was used whereby a control film was scanned with every experimental film in a defined window placed at the same position on each measurement. The resulting scans were then corrected for any interscan variations based on the control films result compared to the average result in a technique similar to that used by Lewis and Devic. Results for measured dose for the varying size bolus/scatter material were made using a calibration dose curve produced from the same film batch irradiated in equilibrium conditions with the same 6MV X-ray beam. [Figure 2] shows the percentage build-up dose characteristics for the 6MV X-ray beam for field sizes ranging from 5 × 5 cm up to 40 cm × 40 cm at an SSD of 300 cm. Percentage surface dose results range from 20% for the 5 cm × 5 cm field up to 66% for the 40 cm × 40 cm field. This is compared to 10% (5 cm × 5 cm field) to 42% for the 40 cm × 40 cm field at 100 cm SSD. 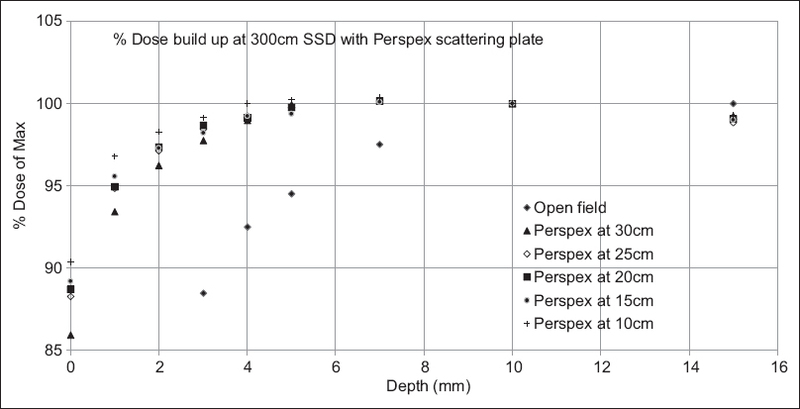 [Figure 3] shows the results for build-up characteristics for the 40 cm × 40 cm field when measured at 300 cm SSD and the 10 mm beam spoiler is located at the quoted distance from the phantoms front surface. Results show that the surface dose increases to 86–91% for the configurations tested here and that the dose at 1 mm depth was 94% or higher. The results also show that a maximum dose (within 0.5%) is measured with at least 5 mm or greater added front scatter. 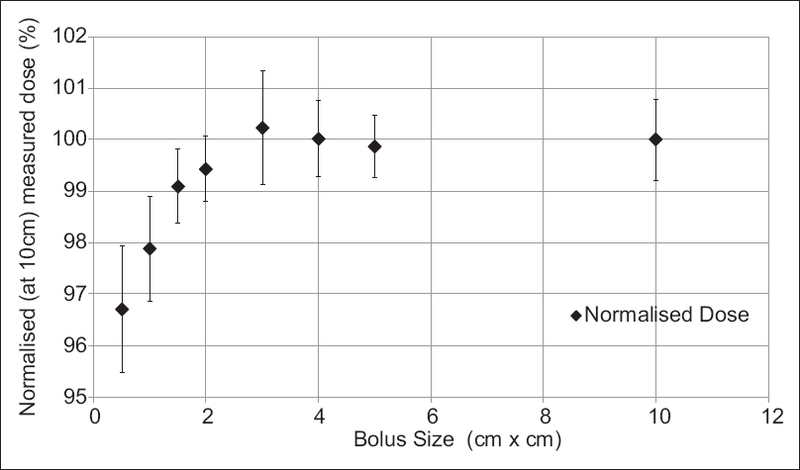 [Figure 4] shows the results for measured percentage dose when 5 mm thick wax bolus materials were placed over the EBT3 film for entrance dose assessment. Results are shown for blocks ranging in size from 0.5 cm × 0.5 cm 2 up to 10 cm × 10 cm 2 and are normalised to 100% for the 10 cm × 10 cm field. The results have shown that at square bolus sizes <3 cm, a small but measurable drop in dose occurs. These values ranged from 99.5% at 3 cm 2 down to 96.6% at 0.5 cm. Results from [Figure 2] highlight that although the percentage dose in the skin and subcutaneous tissue has marked increases at extended SSD compared to 100 cm, they are still well below the recommended 90% even for the large 40 cm × 40 cm field size which is used clinically for TBI treatments. As such, when a 10 mm beam spoiler is introduced, the build-up characteristics for the 40 cm × 40 cm field size characteristics change significantly as shown in [Figure 3]. These results differ slightly from those found by Ravichandran et al., who found skin dose in excess of 100% for 40 cm × 40 cm field with large beam spoilers. These differences may be accounted for by differences in SSD as well as the distance from the beam spoiler to measurement point and the type of chamber used to measure surface or skin dose. Bloemen-van Gurp et al., however measured similar values using a MOSFET detector. The results for the beam spoiler at 20 cm means the beam spoiler was 20 cm in front of the solid water stack phantom at a distance of 280 cm. Results show that the surface dose increases to 86–91% for the configurations tested here and that the dose at 1 mm depth was 94% or higher. The results also show that a maximum dose (within 0.5%) is measured with at least 5 mm or greater added front scatter. 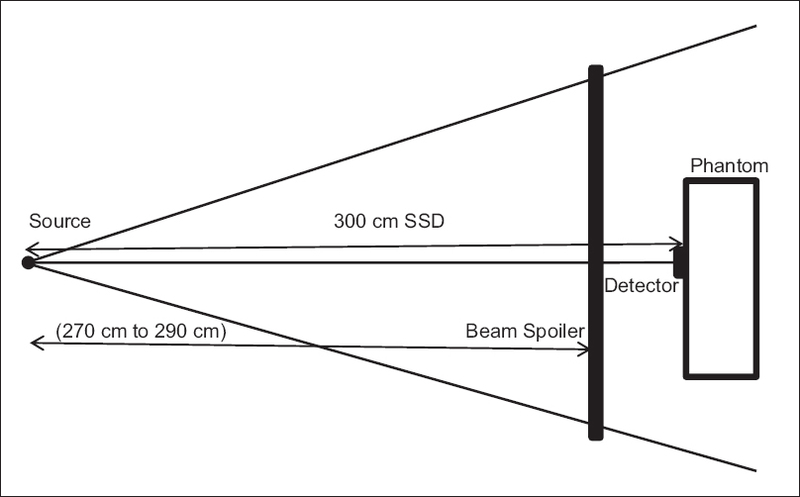 Similar results were found for other distances of the beam spoiler to the measurement site. As such, we would recommend that during in vivo dosimetry, that at least 5 mm of build-up/scatter material to be placed over the detector so that accurate assessment of applied dose can be performed during TBI procedures at extended SSDs. Similar measurement should be made if significantly different setup conditions are used or for other TBI irradiation procedures. The results shown in [Figure 2] and [Figure 3] above are measured using solid water slabs which cover the entire front surface of the phantom. However, when in vivo dosimetry is performed, normally a smaller amount of scatter material is used such as a 3 cm × 3 cm 2 wax block. [Figure 4] highlights the fact that entrance dose measured values ranged from 99.5% at 3 cm 2 down to 96.6% at 0.5 cm. As such, we would recommend the minimum size for bolus/scatter material to be placed around the film would be at least a 3 cm × 3 cm 2 which is also 5 mm thick. Using these parameters, the applied dose during TBI irradiations can be effectively measured using Gafchromic EBT3 radiochromic film. It is important to evaluate dose build-up characteristics for clinical TBI techniques to assure the skin and subcutaneous tissues are receiving appropriate dose levels required. Beam spoilers allow for high skin dose levels, but skin dose can vary depending on the distance of the beam spoiler to the skin surface. It is also essential to provide adequate bolus or scattering material over and around an in vivo detector used to assess dose delivered during TBI treatments. For our clinical treatment procedure, a minimum size bolus was found to be 5 mm thick and 3 cm × 3 cm area. Similar, measurements should be made for TBI dose assessment to measure accurately applied dose in vivo. Eaton DJ, Warry AJ, Trimble RE, Vilarino-Varela MJ, Collis CH. Benefits of online in vivo dosimetry for single-fraction total body irradiation. Med Dosim 2014;39:354-9. Mangili P, Fiorino C, Rosso A, Cattaneo GM, Parisi R, Villa E, et al. In vivo dosimetry by diode semiconductors in combination with portal films during TBI: Reporting a 5-year clinical experience. Radiother Oncol 1999;52:269-76. Lancaster CM, Crosbie JC, Davis SR.In vivo dosimetry from total body irradiation patients (2000-2006): Results and analysis. Australas Phys Eng Sci Med 2008;31:191-5. Allahverdi M, Geraily G, Esfehani M, Sharafi A, Haddad P, Shirazi A. Dosimetry and verification of Co total body irradiation with human phantom and semiconductor diodes. J Med Phys 2007;32:169-74. Briere TM, Tailor R, Tolani N, Prado K, Lane R, Woo S, et al. Patient dosimetry for total body irradiation using single-use MOSFET detectors. J Appl Clin Med Phys 2008 3;9:2787. Su FC, Shi C, Papanikolaou N. Clinical application of Gafchromic EBT film for in vivo dose measurements of total body irradiation radiotherapy. Appl Radiat Isot 2008;66:389-94. Butson MJ, Perez MD, Mathur JN, Metcalfe PE. 6MV X-ray dose in the build up region: Empirical model and the incident angle effect. Australas Phys Eng Sci Med 1996;19:74-82. Yu PK, Cheung T, Butson MJ. Variations in skin dose using 6MV or 18MV X-ray beams. Australas Phys Eng Sci Med 2003;26:79-81. Morales JE, Hill R, Crowe SB, Kairn T, Trapp JV. A comparison of surface doses for very small field size X-ray beams: Monte Carlo calculations and radiochromic film measurements. Australas Phys Eng Sci Med 2014;37:303-9. Khan F. The Physics of Radiation Therapy. 3rd ed. PA, USA: Lippincott, Williams and Wilkins; 2003. Withers H, Peters L. Innovations in Radiation Oncology. New York, USA: Springer-Verlag; 1988. Butson MJ, Yu PK, Cheung T, Metcalfe P. Radiochromic film for medical radiation dosimetry. Mater Sci Eng R Rep 2003;41:61-120. Brown TA, Hogstrom KR, Alvarez D, Matthews KL 2nd, Ham K, Dugas JP. Dose-response curve of EBT, EBT2, and EBT3 radiochromic films to synchrotron-produced monochromatic X-ray beams. Med Phys 2012;39:7412-7. Cheung T, Butson MJ, Yu PK. Post-irradiation colouration of Gafchromic EBT radiochromic film. Phys Med Biol 2005;50:N281-5. Butson MJ, Cheung T, Yu PK. Absorption spectra variations of EBT radiochromic film from radiation exposure. Phys Med Biol 2005;50:N135-40. Lewis D, Devic S. Correcting scan-to-scan response variability for a radiochromic film-based reference dosimetry system. Med Phys 2015;42:5692-701. Ravichandran R, Binukumar JP, Davis CA, Sivakumar SS, Krishnamurthy K, Mandhari ZA, et al. Beam configuration and physical parameters of clinical high energy photon beam for total body irradiation (TBI). Phys Med 2011;27:163-8. Bloemen-van Gurp EJ, Mijnheer BJ, Verschueren TA, Lambin P. Total body irradiation, toward optimal individual delivery: Dose evaluation with metal oxide field effect transistors, thermoluminescence detectors, and a treatment planning. Int J Radiat Oncol Biol Phys 2007;69:1297-304.